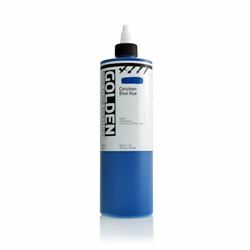 Golden High Flow Acrylic 16 oz. 49 colors, including Fluorescent and Iridescent Colors made with the same ingredients of other GOLDEN Artist Colors paint lines. Formulated with 100% acrylic polymer dispersion, resulting in a durable paint layer with excellent water and chemical resistance. Made with finely ground pigments to reduce clogging issues in small tips and nozzles. Additives such as flow improvers, film levelers and retarders create a very thin and free-flowing paint. Application use ranges from fine line-work to large passages on a variety of surfaces, such as paper, canvas, panel and other artist supports.